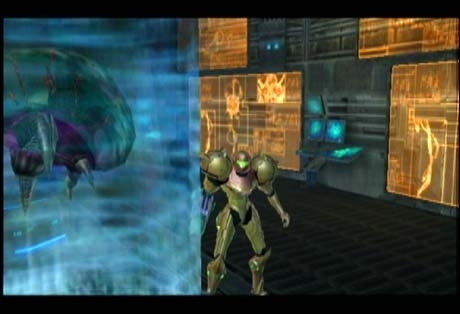 metroid prime 3: corruption was the last main metroid game i had to finish, but it took me a ridiculous amount of stopping and starting before i finally sat down and gave it enough attention to see it through to the end. 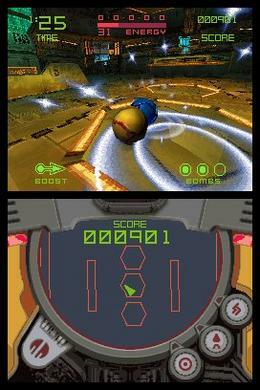 the game was one of the earliest wii games, and definitely and immediately proves that the wii’s controls are ideal for FPSes as the game features a smoother control than ever before seen on a home console. presentation- and content-wise the game doesn’t feel like much of a step up from the gamecube games; in fact the metroid prime formula is followed so closely that despite the polish i found myself more bored than i have been in almost any other metroid game (how much more scanning do i have to slog through??). there are some minor differences, although for me not enough to keep the momentum going. there’s a stronger emphasis on combat, which didn’t really interest me much, especially since the difficulty of the game is incredibly low (perhaps due to it being on wii and an attempt to bring the series to a new audience). like recent entries in the series the game is fairly linear, but the inclusion of warp points (common in the zelda series but new for the metroid series) is appreciated, although hopping between multiple planets is a cosmetic change that doesn’t add anything new in terms of gameplay. samus’s ship plays a greater, albeit still quite minor, role, but the gesture-based controls do add a feeling of immediacy and help make the experience feel unique. i’m a bit ambivalent about the expansion of the metroid world to include additional characters and voice-acted interactions, such as with random soldier NPCs. part of the appeal of the series has been the sense of isolation, and on the one hand, adding more characters, etc. helps add motivation to the plot, while on the other hand the most notable additions, the three rival bounty hunters, mostly come across as being little more than x-men rip-offs (despite this gandrayda still turned out to be pretty cool). the hyper mode system is a bit gimmicky and pointless and didn’t really appeal to me (in fact, the producer says that retro was reluctant to include it at the beginning). unlocking bonus content via tokens (inc. tokens you can only get by exchanging over wi-fi with a registered friend) is also fairly pointless and annoying. it seems the majority of reviewers didn’t share my opinion overall, however, as it received rave reviews upon its release including a perfect score from ye olde nintendo power. it’s great to finally have this final metroid notch on my belt, and the controls make me really look forward to revisiting MP1 via the metroid prime trilogy. i’m really looking forward to seeing where the series goes, especially after the lukewarm response to other M, and i hope that some of the hunters from the DS game make a return someday. retro studios proved themselves with a bang with their amazing take on the metroid series with their first metroid prime release, but it remains to be seen if they, or any other studio, can repeat their breath-taking feat with the series. i, for one, am definitely looking forward to it, and also to replaying all the games in this amazing series. this is gonna be a short ‘un. for the most part i try to play games in a series in order, but it don’t always work out that way. case in point: i played through metroid prime hunters even though i hadn’t played the demo of the game that preceded it by more than a year. but i got my mitts on the demo soon after that, so i thought i would take it for a spin even though i was going about it all backwards. oftentimes when i finish a game if i have the next in the series lying around i’ll try it out just to get a taster for how the series progresses. so even though i’d just finished playing metroid prime: echoes, i tried out the next in line, metroid prime: hunters for DS … and found myself totally hooked. the first thing you notice is how great the game looks; it’s impossible not to be amazed at how much of the gamecube metroid prime games’ design they managed to fit onto the DS. the game includes movie cut-scenes that also look pretty good. the game does a pretty good job of making the most of the hardware and masking its limitations, except for a fair amount of enemy reuse (including the bosses, of which there are only two main ones that are repeated four times each, with variations) and too many places where rooms are overly symmetric or the room designs are reused too closely. the latter becomes apparent even from the first section of the game where there are three rooms in a row that are pretty much identical, making it too easy to get confused about which room you’re in and which door you’re heading towards. i definitely enjoyed the single-player “adventure” mode, although as people have noted the game is fairly linear. it’s divided into nine sections, two on each of 4 worlds and a final stage, although after all the backtracking of MP2 i found the rigid pacing (and warp portals) to be for the most part refreshing. there’s a clear emphasis on action over exploration, and the game highlights one-on-one battles with 6 spankin’-new rival “hunters”. the rival bounty hunters are pretty well designed and their unique abilities make the multiplayer mode entertaining (although i couldn’t really get into it; just not into FPS games enough i guess). the one drawback to the “formula” is that each of the 8 main sections of the game require you to “escape the planet” in a race against the clock, and having to deal with forced timed battles is just annoying. luckily, automatic temporary save points are fairly numerous. all these differences give the game quite a different feel from the usual metroid game, which is why i found that i wanted to continue playing (and ultimately finish) the game even though i’d just finished MP2. another thing that people complain about often is the control scheme. the stylus mode is really the only viable option since the buttons-only mode doesn’t give nearly enough fine control, but the problem with that mode is that your hand gets cramped easily. however, i did find that after i’d played for a while i got used to it and my hand didn’t feel cramped so much. i’m really curious about trying the game out with a “thumb stylus”, which you can read about here and also here. the latter link is from a post at IGN about the original DS which came with an early demo version of MP:H, which i’m also curious about trying out. among my other, more-minor complaints, are that the morph ball mechanics are less forgiving than the other prime games and that there are rather too many insta-death situations, both of which cause some really tedious sections of the game. the story is yet another rehash of the first prime story, and i beat the game without realizing that there’s something you’re supposed to do to get the actual ending which was also quite annoying. – if anyone’s interested, nintendo power’s coverage of the game included a preview of the multiplayer mode (march 2006, v. 201), a cover feature and a poster of the hunters (april 2006, v. 202), a review (may 2006, v. 203), and a guide to beating the final boss (june 2006, v. 204). finally beat metroid prime 2: echoes this week. (here’s a good run-down of the game for anyone who hasn’t played it.) 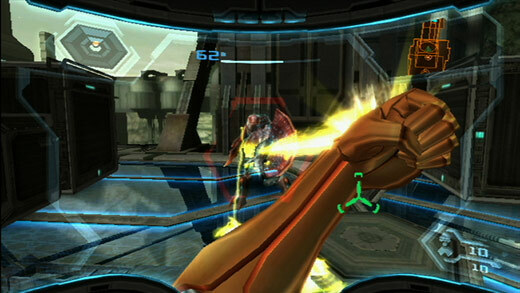 the game seems to be universally praised for being an expansion of the original metroid prime, but the consensus is that it doesn’t offer a whole lot that is new. some people feel that the game does everything that was in the original, but “better”. i was blown away by the original when i played it a few years ago, but much as i love the metroid series i found this entry to be somewhat tedious. the game not only lacks the freshness of the original, it just feels too similar, and its storyline of a threatened alien race feels incredibly stale. among my complaints are that the game seems twice as long as the first one, and it seems to have a lot more backtracking in general. i’m always skeptical of games that create an “alternate world” in order to reuse much of their design, and like my opinion of final fantasy 3 (a.k.a. 6) the majority of the alternate world in MP2 feels like unnecessary padding. also, when first encountering the “dark” world of MP2 the environments are fittingly drab and somewhat difficult to navigate due to the monochromatic purple color palette. i did appreciate the different feel of the pacing in the dark world, which requires you to hop between the various safe havens of light that are spread out in each room, but by the game’s end the dark world’s galaxy of purple oppressiveness is just boring and dull, dull, dull. people often mention the boss fights, and they are fun because they require you to actually strategize to determine each boss’s weakpoint; but they’re also somewhat annoying because each boss fight has multiple sections, all of which require some trial and error to master. this definitely gives the boss fights a very same-y feeling, which is unfortunate because for the most part they’re very well designed. the final boss fights are the most annoying of the game, and the game’s ending is pretty lame. i also had mixed feelings about the fact that the game only has three alternate endings: one for if you finish with less than 75% of the items, one for finishing with more than 75%, and one for finishing with 100%. lastly, i didn’t have anyone to try out the multiplayer with, but i checked out all the stages and it looked like it could be pretty fun. not sure why it gets dissed so much, but i’m guessing that’s probably just in comparison to other multiplayer FPS games. despite all my complaints this was definitely a worthwhile entry in the series and i have a feeling it’s one of those games that’s much more fun the second time through. 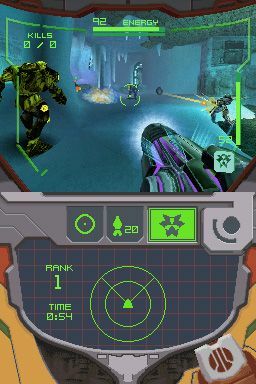 i’ve already dipped into the next game in the series, metroid prime hunters on DS, and have been quite enjoying the new interface. 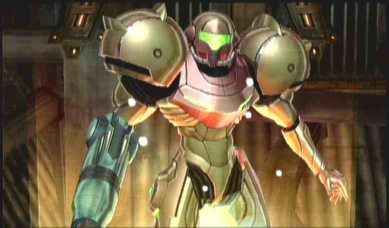 and i’m really looking forward to playing through metroid prime 3 on wii. and who knows? i may even finish those just in time for the new metroid: other M, due out sometime next year. – video of the 100% ending. for all that effort you’ll be rewarded with a few seconds of extra video, yippee! 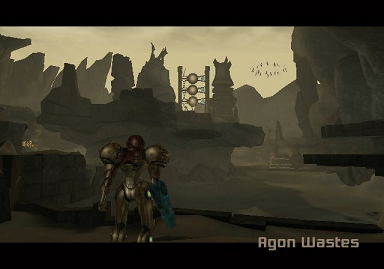 – www.metroid2002.com: a site devoted to sequence breaking, etc. of the metroid games. also has links to speed runs, and videos of all sorts of useless but cool minutiae. – metroid-eu.com: someone’s typed out all the creatures, chozo lore, and pirate log entries if you’re interested. also has maps. – metroid manga: screencapped and translated from the official nintendo of japan site. haven’t read it yet, but it looks cool. – metroid database: tip and tricks: lists the critical scans (ones you can only get a limited time) all in one place. also has a nice walkthrough.